The double thumbs-up of the “thumbed-down” generation of iPhone texting-addicts is perhaps the most vivid icon of modern mass society and a ubiquitous symbol of a lot more that is and isn’t going on in the minds and souls of the youth labor pool. Apart from the kind of obsessive-compulsive texting-induced “devolution” of human social and cognitive performance I’ve previously discussed in “Digital Skills: a Thumbing Down of Job Performance”, out-of-control texting is exacting a horrid toll in broader existential terms. These are costs reckoned in terms of life purpose, goals (including professional) and what it means to authentically be, relate to or remain a person, both on and off the job—“authentic” in the sense meant by the last century’s existentialist philosophers, such as Sartre, Camus and Jaspers and conveyed by the works of Shakespeare (which abound in deep thoughts about one’s “sweet prince” rather than “tweet (formerly known as) ‘Prince’”. In a clear sense, texting in its usual form is the antithesis of and anathema to existentialism, to the extent that the rich and profound reflection on life the latter exhorts is deleted from consciousness at the push of one button and then another. The new school of thought—or non-thought—can be called “textistentialism”, a techno-driven hybrid of bad habit and even worse unspoken philosophy. The main behavioral manifestation of this outlook is incessant manic personal texting, not beret-existentialist 1950s bongos, bongs and beat poetry readings in dim cafes—of course not, when poetry requires more cerebral and screen space than a cell phone is designed to accommodate. But the rapid-fire button-pushing Skinner-box pigeon texting just skates the surface of a very deep shift in values and perception—a mindset that, in its behavioral manifestations, is really beginning to irk employers, as well as anyone who misses the art of conversation, real thinking and fuller communication. The report states that Garden centre boss Richard Haddock, aged 54, and a high-profile British farmer who led fuel protests in the 1990s and, more recently, the campaign against a government Foot and Mouth policy, despaired of the youngsters he was sent. Not one to mince words, Haddock branded Britain’s new generation of teenagers as “having no work ethic and unfit for the labour market”. He says that he is now recruiting older people and workers from abroad after abandoning hope of being able to find suitable candidates at the Jobcentre. Unprofessional? Of course. “Unworkerish” in general? Again, yes. (Notice how English seems to have no word to describe a non-professional’s “unprofessional”, substandard workplace behavior. A keyword search for “unprofessional worker” at the reverse lookup dictionary generated as near-synonyms occupations and near-occupations, such as “engraver”, “electrician”, “dairymaid”, “balloonist”, “hobo” and “slave”, suggesting that its software, like many people, can’t distinguish a non-professional from an unprofessional. “Unemployeeish” won’t work either, since it sounds like “characteristic of an ex-employee”, rather than a bad currently employed employee. Irrespective of whether a job requires professional, high-level qualifications, every job requires getting the job done. Accordingly, even unskilled entry-level employees, like the ones Haddock bemoans, have a duty to do what they are getting paid for. However, beyond the obvious and other job performance costs of job-irrelevant texting inflicted on employers by textistentialist employees are what might be called the “existential costs”—additional costs inflicted not only on employers, but on everyone, by the tacit unreflective philosophy of life that underlies the nutty preoccupation with texting in order to “reach out and touch someone” constantly. In terms of addictive dependency on other people, perhaps texting is surpassed only by the dependency of a fetus on its umbilical. While, for some at a later stage in life, being unable to walk without a cane is perfectly understandable, why on Earth are so many who are so much younger apparently unable to take a single step without a cell phone in hand? In fusing their palms to their cell phones and refusing to put them down—recall ”from my cold, dead hands” (NRA spokesperson Charleton Heston’s memorable and similar gun-rights credo and taunt to those who would try to seize his guns), these addicts arguably satisfy the definition of “cyborg”—part human, part machine. 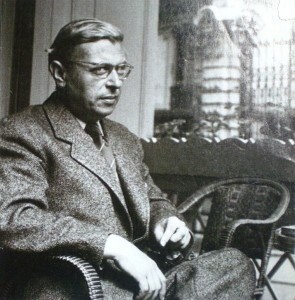 Sartre and Albert Camus may have correctly identified as hallmarks of an “authentic” life for an existentialist profound self-awareness, the heavy and permanent burden of having to choose without external help or crutches, the exercise of free will and the limitations of scientific and other “organized” knowledge. But for the textistentialist, myopic and trivial self-absorption, mundane choices (such as where to eat or shoes to buy), being totally willful and indifferent to or ignorant of scientific and other organized knowledge supersede all of that “so 20th-century!” stuff. “So what?”, you say—how does any of this affect a recruiter’s bottom line? Here’s how. A job candidate who is a textistentialist is, I believe, likely to be more concerned about the mere fact of or number of connections between minds and organizations than the contents or merits of those minds and organization. In terms of networking, this means being more concerned about the links than the nodes (the termini of the linking lines). If the job requires making connections with clients, associates or whatever, a textistentialist is, as I see it, more likely than others to give as much, or more weight to the fact of or number of connections than to their quality—much as some people on LinkedIn and almost all teenagers on Facebook do when, consciously or not, they gauge the worth of their networks and, by implication, of themselves. In short, in hiring a textistentialist, there may be the increased likelihood of hiring someone who is motivated more by “doing the numbers” than others are—which is great if volume of contacts counts more than their quality or anything else. That is, if whatever value of that high-numbers orientation is not neutralized by a high volume of personal texting. A textistentialist is also less likely than others, in my judgment, to have an “autonomous” personality structure—a capacity not only for independent (social and mental) existence, but also for independent judgment. These two go hand in hand. In particular, and perhaps above all, a textistentialist’s values are very likely to be the product of osmotic pressure-driven peer-group diffusion and absorption, rather than any independent reflection. Another Frenchman—mathematician, inventor and philosopher, Blaise Pascal—famously said, “”The sum of a man’s problems come from his inability to be alone in a silent room.” Likewise, many, if not most great thoughts, insights, discoveries, plans and inventions occur precisely in such sustained solitary or at least semi-solitary intellectual and creative circumstances. Independent judgment, functioning and insight require a capacity for independent existence. Collaboration, yes—to catalyze and complete the creative process, but not to replace it. In this connection, the historical evidence is pretty compelling: Newton, Darwin, Freud, Einstein, Marx and other giants of history relied primarily on the influence of one confidant as an intellectual umbilical and incubator—not hundreds of superficial texting and Facebook friends. Newton’s main influence was his Cambridge University mentor, mathematician and theologian, Isaac Barrow; Darwin’s was geologist and lawyer, Charles Leyell; Freud’s was Dr. Wilhelm Fliess, famous for his cocaine studies (or Dr.Josef Breuer); regarding Einstein’s 1905 Nobel Prize—apparently not, as some have argued, his first wife and physicist in her own right—instead, a medical student, Max Talmud, who many years earlier dined once a week, for six years, with the young Einstein and his family, exposing Albert to the sciences, mathematics and philosophy ; Karl Marx’s— his Communist Manifesto co-author, collaborator and patron, Friedrich Engels. On the other hand, a man or woman who would have no confidant is likely to go insane, although (s)he who has too many is likely to go nowhere, save for smack in the middle of the bell curve—confirming the statistical truth that nature does and recruiters should favor such extremes of complete job-candidate solitude and texty-togetherness only when it can conceivably pay off. Otherwise, hiring the candidate who neither has any phone nor can’t put his or her cell phone down is probably going to be a bigger-than-normal gamble. To confirm the wisdom of limiting, but not eliminating your confidants, ask any fetus—including years after birth. But preferably one without an addiction to texting, unless that’s what you are looking for.